$2.54m, 100km Creswick Trails Project now underway, it is expected that by May 2019, some of these new trails will be incorporated into our annual event. Registration: All registrations must be done prior to race day. There will be no on-day registrations accepted. This is to help the very small team that puts on the race each year and will ensure an on-time start. All participants must register prior to the 5pm cut off on Tuesday, May 7th via EntryZone. Entries Open Monday, February 4th. Plate and Timing Chip collection: There will be no on-day registrations taken. Race plates and timing chips can be collected 8.30am-10.00am on race day. We encourage everyone to collect their race plates early to avoid missing race start. The course will become unsupported 4 hours after race start, so pick the distance that best suits you. Starting from Hammon Park you’ll head into the hills around Creswick. 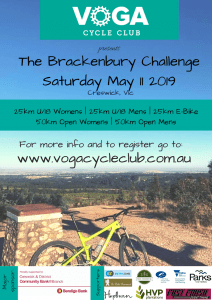 You’ll pass through native forest, around lakes, through pine plantations and see some pretty damn good views from the top of the races’ namesake, Brackenbury Hill. We don’t need to say this, but will to be extra sure – you need to pre register, no on the day entries accepted. *A little bit about the cost: these costs do not include the purchase of a race day licence or the upgrade of an exisiting recreational licence for race day. If you have a valid MTBA race licence, or free trial membership (that is valid on race day), there is no more to pay. Competitors with no MTBA membership, or recreational licence holders will need to either purchase a day licence, or upgrade their membership for race day. This can all be done via EntryZone. ^Junior men and women – age needs to be 17 or younger on race day. If you are 18 or older on May 11 2019, enter an open category. E-bike category will be a single combined category. It is a test event (but still a race!) for 2019 and if popular, we will look at multiple e-bike categories in the future. Valid licences will need to be presented at plate collection and VOGA reserves the right to deny entry for those without the correct level of coverage. It is up to each individual to ensure they have the correct licence in order to race.